Christmas Comes Early This Year, Thanks to Excalibur II! This year I haven't been able to get out very often between work and some health problems. So I spent my time doing research on places to detect, which lead me to a little out of the way beach only a couple of hours drive from my home that looked promising. I was working the low tide area late at night and had been detecting for 4hrs, finding a few coins, junk jewelry, pull tabs and fishing sinkers. I was getting tired but I knew the sinkers were a good sign. I heard a very faint signal, after numerous attempts with my scoop in waist deep water I was rewarded with the glint of gold in the scoop. 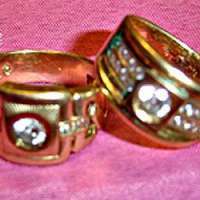 I plucked out a nice Man's ring gold and diamond, 18K weighing 11.3 grams with a nice diamond in the center 3 small diamonds on each side. I was instantly refreshed and continued my search for another 15 minutes, when I heard another faint signal. Again after several attempts with my scoop in waist deep water, my headlamp caught the flash of gold in the scoop and there was another Man's gold & diamond ring, again a nice diamond in the center 10 small diamond chips on each side 18K and 9.1 grams. 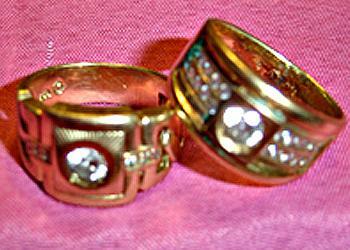 I couldn't believe that I found not one but two Men's Gold and Diamond Rings. I continued working area for another hour until I was worn out. I found a small copper ring and almost 10 dollars in change for my efforts. There is nothing like that feeling when you see a gold ring at the bottom of your scoop especially when you are alone on secluded beach late night! The best part of it is now I don't have to worry about trying to figure what to get my 2 sons for Christmas. This year my Excalibur II provided their Christmas gifts which they will enjoy for many years to come! Thanks Minelab! I have had my Excalibur II for a little over a year and from day one, I have never been disappointed with this machine. I have used different types of water detectors over the years but the Excalibur II is at the top. Thank You making a great product! Make sure you keep Karen as she is a great person to deal with. Wonderful transaction again.